One line item indicates Apple has at least "one more thing" for consumers. At the end of May, Apple (NASDAQ:AAPL) SVP Eddy Cue told Re/Code, "We've got the best product pipeline that I've seen in my 25 years at Apple." That's a bold statement, considering Apple's excellent run of new products in the last decade-and-a-half. But, one line item from Apple's earnings results indicates the company is working on something important. Perhaps its just a new version of the iPhone with a larger screen, or maybe it's the long-awaited wearable device. It could be a payments service, or it could be something nobody saw coming. 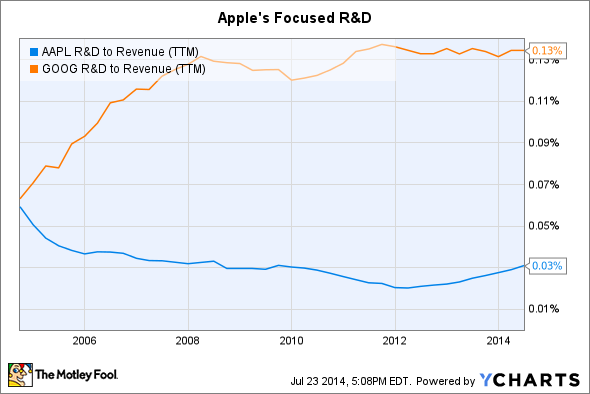 One thing is for certain -- money doesn't lie -- and Apple is spending a lot of money on R&D for new products. Apple hasn't typically spent as much on R&D as a percentage of revenue, compared to competitors like Google (NASDAQ:GOOG) (NASDAQ:GOOGL). Apple has always prided itself on making a few great products. Comparatively, Google spends money researching things like "balloon-powered Internet." As Apple's revenue grew like a hockey stick, the percentage of revenue the company spent to develop new iterations of its iPhone and iPod declined. In the run up to the release of the iPad in 2010, R&D spending as a percentage of revenue increased somewhat, from 3.3% in fiscal 2007 to 3.6% in fiscal 2009. But, R&D spending as a percentage of revenue never returned to pre-iPhone levels until last quarter. Interestingly, Google and Apple have seen similar percentage increases in revenue over the last 10 years. 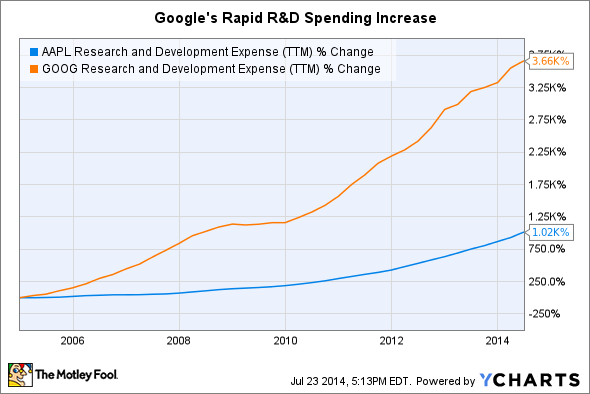 Google, however, has increased its R&D spending 3.6 times faster than Apple, and increased R&D spending as a percentage of revenue. Obviously, the strategy has paid off for the Internet giant, as its revenue, profits, and stock price have all soared in that period. If you take revenue out of the equation, though, the absolute growth in R&D spending in recent years is huge. 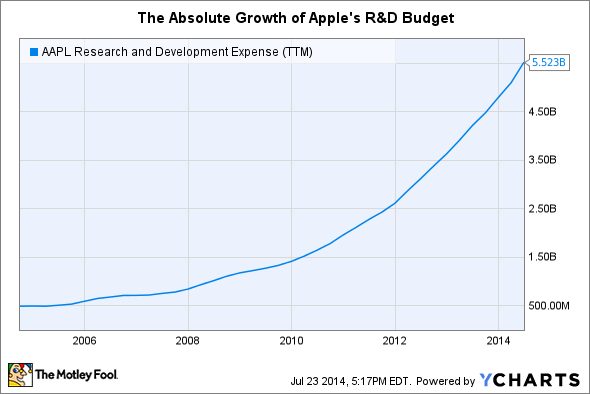 Over the last four quarters, Apple's R&D budget increased to $5.5 billion. 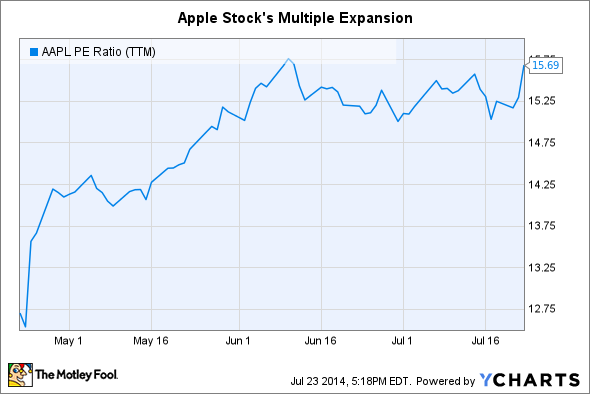 For fiscal 2014, Apple is spending at a $5.8 billion run rate. In fiscal 2011, the first full year of iPad sales, R&D spending was just $2.4 billion. Apple bears are keen to point out that Apple hasn't released anything particularly innovative since the iPad, yet the company has increased R&D spending by over $3 billion per year. I'm pretty sure it doesn't take $3 billion to make the iPad smaller or improve the specs on the iPhone. Apple was able to improve the Mac for years with an R&D budget well below $1 billion. When will we see new products? Apple's guidance for the third quarter ($37 billion-$40 billion in revenue with 37%-38% gross margin) indicates that it doesn't plan on releasing any new products until at least late in the quarter. An obvious launch date would be at Apple's annual product refresh event in late September. With unit sales growth of the iPhone slowing (13% year over year last quarter), and negative growth in iPad units (down 9%), Apple could certainly use another product to improve revenue. With the stock's earnings multiple expanding since the company's previous earnings release, investors seem to believe something big is on the horizon. The stock is still priced at a relative value, but it's not nearly as inexpensive as it was just three months ago. If that next big thing will launch in September is unclear, but Apple is working on something and management is particularly excited about what's in the pipeline. Tim Cook reiterated at the end of his prepared remarks for the earnings call, "We have an incredible pipeline of new products and services that we can't wait to show you."